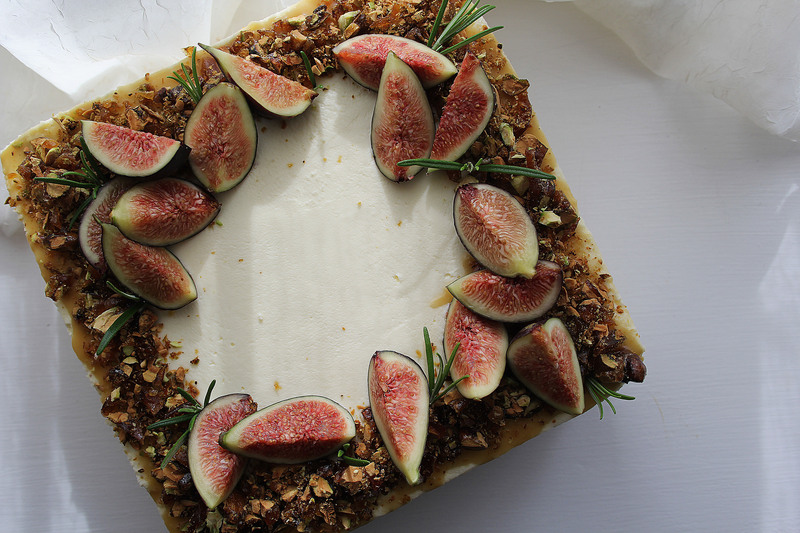 Ripe, pink fleshed figs are one of my very favourite fruits and pair brilliantly with so many other ingredients, from goats cheese and honey to cured hams and walnuts. 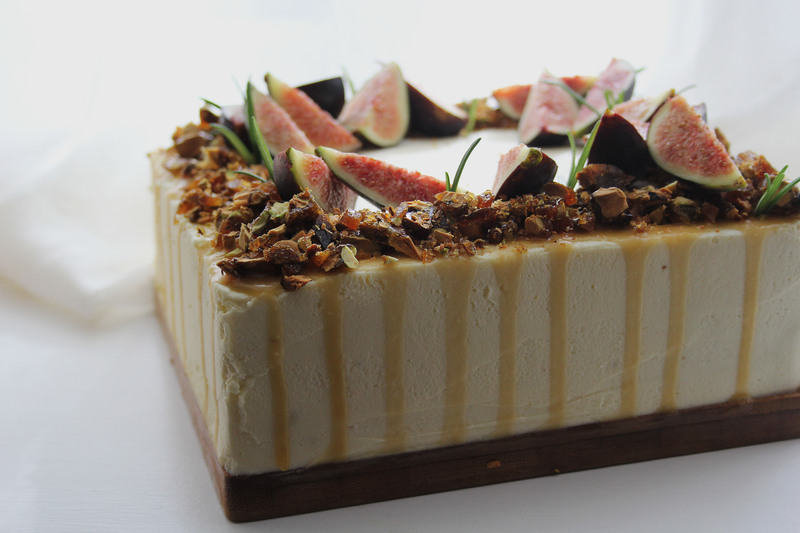 In this cake I have used dried figs soaked in tea ( a method commonly used with dates to make sticky toffee pudding) to flavour the spiced sponge, then added a salty sweetness with the caramel drizzle and finished it off with a tangy mascarpone cheese icing, earthy pistachio praline and slices of fresh fig. 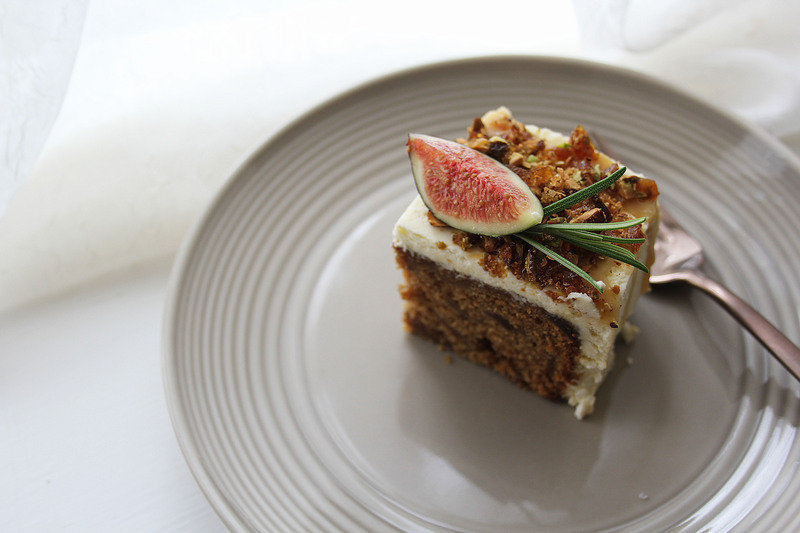 Though the finished cake makes for a really beautiful centre piece, you could also enjoy it as a warm pudding with the salted caramel and a big scoop of vanilla ice cream. Preheat the oven to 170c fan (325F/ gas mark 3). Grease and line a deep square tin (around 22x22cm). Place the chopped dry figs in a bowl or jug and pour over the hot tea. Leave to infuse while you start making the cake batter. In a large bowl (or bowl of a stand mixer with paddle attachment) cream together the butter and sugar along with the vanilla until light and fluffy. Add in the eggs one at a time, beating well between each addition. Once the eggs are incorporated, sift in the flour, bicarbonate of soda, spices and salt. Fold until the batter is smooth and all the ingredients are well combined then tip in your soaked figs (along with the tea) and fold once more. Tip the mixture into the prepared tin and level off. Bake for 45-50 minutes or until a skewer comes out clean with just a few moist crumbs attached when inserted. While your cake is baking, make the salted caramel. To do this simply pop the butter, syrup, sugar and cream in a saucepan and melt together. Once melted bring to the boil and let it bubble for a couple of minutes, then remove from the heat, add the salt to taste and leave to cool. Next, make the pistachio praline topping. Line a tray with greaseproof paper and put the sugar and pistachios in a heavy bottom pan. Heat gently until the sugar starts melting. Swirl the pan occasionally to coat the pistachios and prevent burning. Once the sugar has completely melted increase the heat and turn the pistachios with a wooden spoon until the caramel reaches a deep golden colour, then tip onto the prepared tray and leave to set hard. Lastly, make the mascarpone icing. In a large bowl (or bowl of a stand mixer with whisk attachment) whisk together the mascarpone, cream and icing sugar until you have a spreadable (but not overly whipped) consistency. Once your cake is baked, prick lots of holes all over the surface and pour on about 2/3 of the salted caramel, allowing it to sink into the sponge. Leave to cool in the tin. When your cake is completely cool you’re ready to decorate. Spread the mascarpone icing in an even layer all over the top and sides (or just the top if you like, it’s up to you!) and smooth with a palette knife. Use the remaining cooled caramel to drizzle down the sides then crush up the praline and sprinkle around the edges. 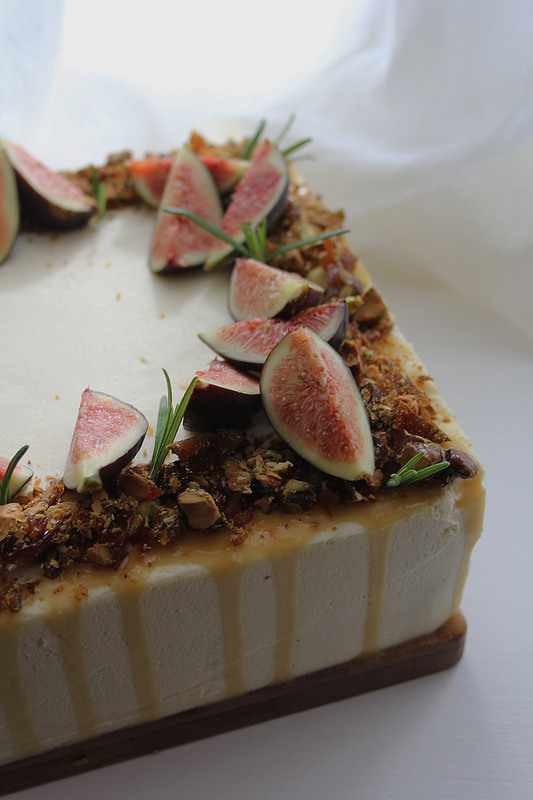 Arrange the fresh fig slices on top and add some woody herbs (such as rosemary) for colour.